If you live and work in London you’ve a few options of how to get in to work, you can sit in your car for hours not moving and getting irate at everyone, by driving to work. If you don’t fancy that you’ve got some other options. There’s getting your face stuck in someone’s sweaty armpit on the tube. Or getting on the bus… Then, oh if you’re lucky you can get the clipper, which is a boat down the Thames, with half the bankers from the city, who are recovering from last nights BNO (regardless if it’s a Tuesday). Or, if you’re really lucky, you can cycle, like me. Of course, you don’t just have to live in London and you don’t just have to be cycling to work to get on your bike but if you’ve a daily commute it’s possibly something you’ve considered or even do now. Cycling to work and back poses more issues than just getting there safely. If your commute (like mine) is around six miles, maybe you’ve questioned getting donned fully in Lycra, cycling shoes on, it would need to be 10+ miles before I start slipping in to the silky smooth Lycra. I want to arrive to work safely and in relative style but most of all comfort. Imagine, a cycling world where you can cycle to work in the clothes you fully intend to work in all day, be comfortable for both and not look like you’re an extra in W1A, but most of all, not stink the office out. That’s the worst. Stinky, sweaty, ill-fitting, uncool clothes in the office. You don’t want to be that guy, you don’t want to be that guy, at all. “Yup twenty miles in these clothes today and still looking fresh.” No, no you’re not, my friend, the showers are that way. A few fashion brands have hopped on the cycling bandwagon, Levi‘s and Ted Baker have recently updated their commuter range, while brand like Huez* and Vulpine have made the step towards fashionable clothing which is comfortable on the bike, too. It’s not only the cycling clothing though which can help, there’s the bikes too. With more commuter friendly bikes out there if your commute is like mine, just a short hop, then maybe there’s a case for electric bikes, could help to reduce sweat, no? A foldable bike to help with storage issues? Or maybe just a more street friendly bike which doesn’t make you look like a street racer and deals with pot holes and city streets better. Over the next few weeks, I’m going to be challenging brands to send me their best commuter busting clothes. So look out over the next few weeks where I’ll be testing many different kinds of products and letting you all know exactly what I think about them. How are your feet? Are they comfortable, right now? Have you got shoes on or are they feeling the breeze fully sockless? Don’t worry – this isn’t some sort of weird fetish, I recently got sent an e-mail asking if my shoes fitted me correctly, I thought, “Well, they’re on my feet and don’t fall off when I walk around, so yeah, I guess they do…” However, I took this e-mail as ever with a little bit more cynicism than most, what they were really saying were what sort of profile is your foot? Are you flat footed, have a medium arch or high? And are your shoes fitting your feet as they should? It’s not the first time I’ve come across this, we’ve all heard the phrase, being flat footed – it’s where your foot is effectively that. More of your foot is on the floor when it’s planted. A high arch means that very little is touching the floor, mainly the balls of your feet and the outside edge of your foot, the inside edge barely touching the floor at all and a medium arch… somewhere in between. Now I know from past experience I’m like Brian Blessed, a flat footed b*stard. But, how can this affect your cycling? Well, if your foot isn’t sitting right in your shoe, you’re more than likely causing yourself some extra muscle pain during exercise, your foot could be slipping around in your shoe, moving your joints and muscles all over the place. I do use a innersole in my shoe currently, made by Curex, these were a purchase I made with my own hard earned cash. The ones I got an e-mail about to try out though, they’re made by Sole and they’re called the Sole Thin Sport Custom Footbeds. First off, what’s the point? Since you asked… When you’re pedalling away, during your downward stroke the power from you leg muscles goes through your main point of contact with the pedals, your feet. The more power you exert the more pressure through your foot, this brings about pronation (your ankles leaning inwards) in your foot, which isn’t great, too much and it twists the bottom half of your leg causing knee pain, ankle pain, more muscle ache and just complete uncomfort. Innersoles help to reduce the pronation and their job is to try and stop it all together meaning more power through your stroke and less muscle and joint aches and pains. Do I need an innersole? I’ve used one for a good couple of years now, I wouldn’t ride without them. My foot feels more comfortable in the shoe and it helps with aches and pains. Also – let me put it to you this way, Bradley Wiggins, Chris Froome, Team Sky – they didn’t get to where they were without looking at every single area, making ‘marginal gains’ which then added up to one whole massive major gain and three Tour de France victories. 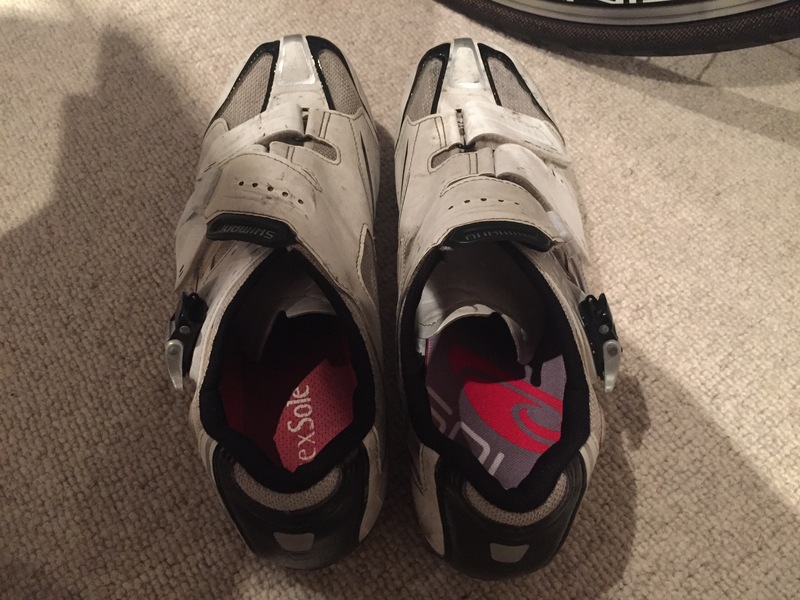 I’m not saying innersoles are going to transform you in to a grand tour winner, but they could possibly be your secret weapon! Helping you to cycle more comfortably for longer periods time time. If you’re buying a new pair of cycling shoes, maybe an innersole should be something you consider. Ask the man in the shop. So I just put them in my shoe? These Sole Thin Sport Custom Footbeds don’t just slide in to your shoe, they take a bit of work. First off, put your oven on and allow it to heat up. Yup, these things are going in to the oven! To mould them to your feet properly, they have to be heated up, the only way to do this is in the oven, the microwave is not recommended. While the oven is heating up take out the soul, sorry sole, of your current shoe. Yes, it more than likely will remove without any fuss or glue marks. Match the Sole to your, erm, sole and make sure it’s the correct size and fit. If it’s too big, just trim around the top with a pair of scissors. Is your oven good and hot? Then you should put the Sole in the oven. When I did this, there’s a little temperature marker on the sole which tells you when it’s at the correct temperature to mould the sole. The marker indicated they were ready pretty much straight away. I left them in a few seconds longer to be sure but I was worried that they would melt in to a gloopy mess on the bottom of my oven and that the inner soles and my oven would be ruined, forever. There’s still more to do… I know that a nice expensive pair of carbon fibre shoes are moulded in a similar way. So if I were worried about these Footbeds ruining my oven, imagine what I’d be like with a load of carbon fibre in there! Quickly take the Sole’s out the oven put them straight in your shoe and then put your feet in to your shoes do them up and stand up straight and still for a good couple of minutes. This then sets the Sole’s to your feet and gives you the correct fitting for your foot type. Finally the process is complete. Relax. Providing you’ve not singed your Sole’s or ruined the oven or scolded your toes. After all that, do they work?! Well, I did notice them in my shoe, yes. I felt my feet were in a different position, not necessarily a more comfortable position mind. I did think this is probably just because the new position was likely the position my feet should be in. During my ride, I can’t say my legs felt more or less comfortable – but my feet! My feet were in pain. I felt like they were being pinched and pushed inwards, they hurt. I was able to finish my ride and it was a similar similar maybe slightly better ride than usual but nothing significant, maybe just marginal. My mind isn’t made up here, I mean, my feet hurt a fair bit. Maybe that was down to me moulding them? I possibly could have left them in the oven for a bit longer just to be sure that they were soft enough to mould but they certainly seemed soft enough when I tried them. Am I going to buy a pair? I’m not going to trade my CurexSole in for them, no. I’ll be sticking with the innersole on the left, I’m afraid. I don’t think they performed very well, all that effort to make sure I’d mould we them correctly and my feet still hurt up to four days later after feeling like they’d been crushed from the sides. Maybe that’s something you get used to but it’s not something I want to put my feet through. I want to be able to perform as best I can as comfortably as I can, not feel like I have to get off my bike just to give my feet a rest. Sorry, but for me, I’m not going to be buying a pair of Sole This Sport Custom Footbeds. It’s every cyclists best friend, a cup of coffee to get you going before a ride. But what’s actually in that coffee and why do cyclists love it so much? So here’s my next point, what’s actually in it? And why don’t you just have a bucket tonne of coffee before heading out on a ride? Well, as with most things in life, there’s a fine balance between too little and too much. Too little, no affect and you get dropped, too much and you work too hard, explode with out realising and get dropped. So it’s difficult. This brings me on to what’s in your coffee? It’s just caffeine, right? And coffee is just, well coffee, right? So if you have two cups before a time trial then you’ll be ok? The general rule of thinking ‘I usually have a cup maybe two before a time trial, that’s my peak caffeine intake.’ What if I were to tell you that that may not be your peak performance but the two performances could be vastly different. But why is that? Well, the difference is your one cup to the last, the fluctuation in caffeine levels can be anything from, 10mg of caffeine all the way up to a staggering 250mg of caffeine. With this gaping chasm of caffeine it can be super difficult to actually judge how much you need. This is just a testers pack – when you buy a pack it comes with a measuring scoop! Like you, I love a cup of coffee before a ride and the people over at Truestart sent me over their ‘performance coffee’ to sample. Yes, there’s such a thing as performance coffee! There will be performance enhancing water next. What is this coffee and how does it work? It’s exactly the same as normal coffee, except a bit more geeky. 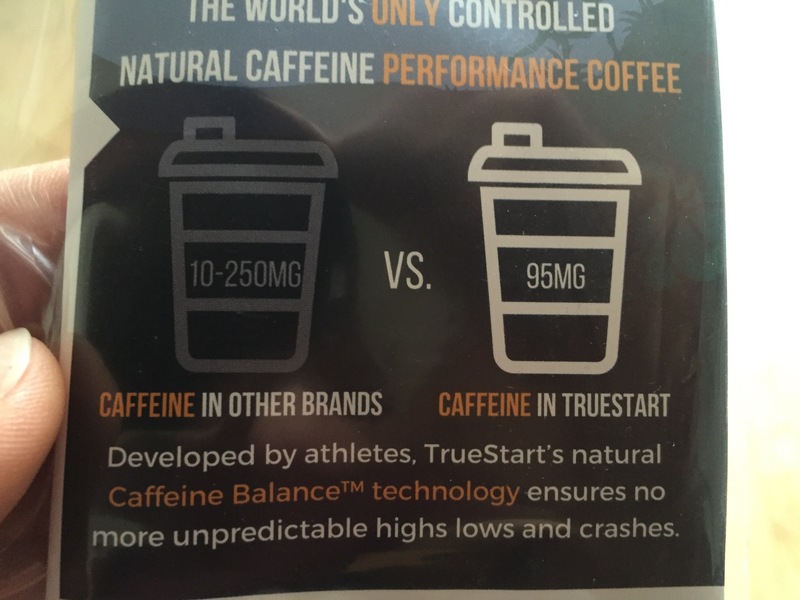 Where your cup contains anywhere from 10-250mg of caffeine, one cup of Truestart contains a much more regulated 95mg of caffeine. You might find that a small figure and no where near what you’d usually have, but if your two cups before that time trial only contained 10mg each and you felt like you were flying, this is over four times more powerful than that measly 20mg you just sunk… It’ll give you more than wings. It works the same way as regular caffeine just in a more controlled manor. Drink thirty minutes before exercise, leaving the human body enough time to do its thing and you’ll feel the caffeine in your system. We’ve all been there when we’ve had too much caffeine and we’re about to have a dreadful caffeine crash. It’s a pretty horrible feeling of a racing heart, shakes, feeling on edge and as if your world is going to come crashing down… Grim. Bet it tastes like mud. Meh, you’d be wrong in saying it but right in thinking it. When I first got it and saw it I thought the same, it’s actually alright though, you know! It’s made from 100% freeze dried (not spray dried, there is a difference – I’m not going in to it but it’s more natural) Columbian Arabica beans, so it’s not swept up off the floor and put in a sachet. It’s nice, really, try it. Am I buying a pack? It depends how you like your coffee. Do you have a cup just to enjoy it before a ride, or, like 35% of people who do exercise, do you have a cup to give you a boost before a ride? If it’s the latter then in my opinion you’d benefit from a cup of Truestart before each ride. I’m a bit of a geek and I like to see things in numbers, I’m one of those who does have a cup to help boost my performance. 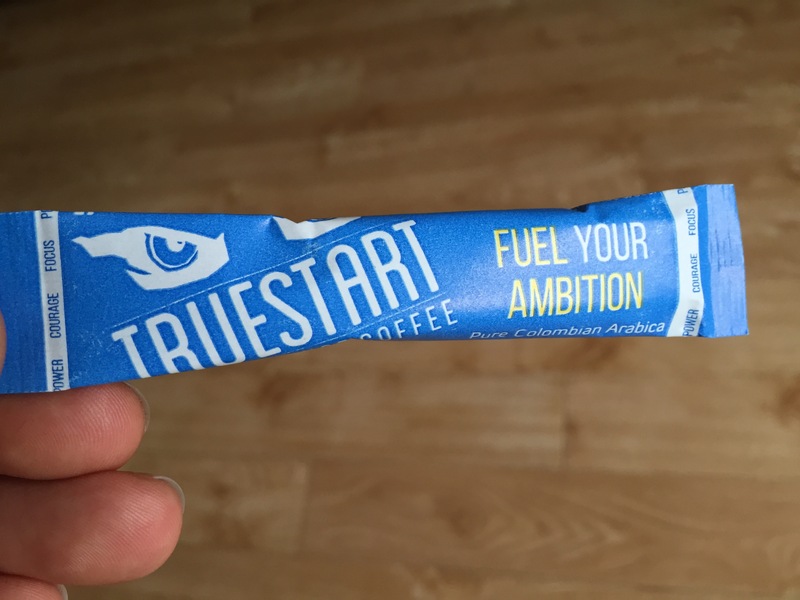 I’d happily replace my pre-ride coffee with a cup of Truestart. Overall, I think it’s superb. Works really well, tastes nice and does exactly what it needs to. Well done Truestart! 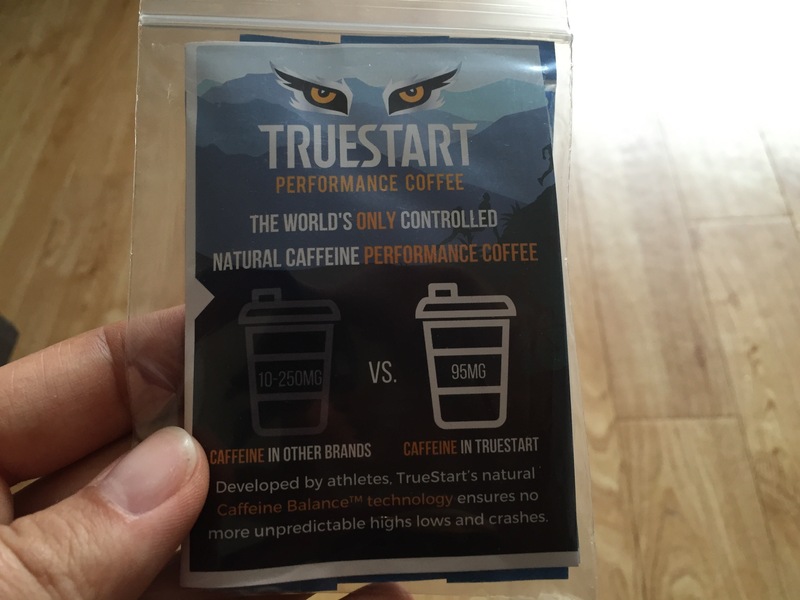 It’s worth mentioning that Truestart performance coffee is not designed specifically for cyclists but all kinds of athletes. Where you can buy it and the links. 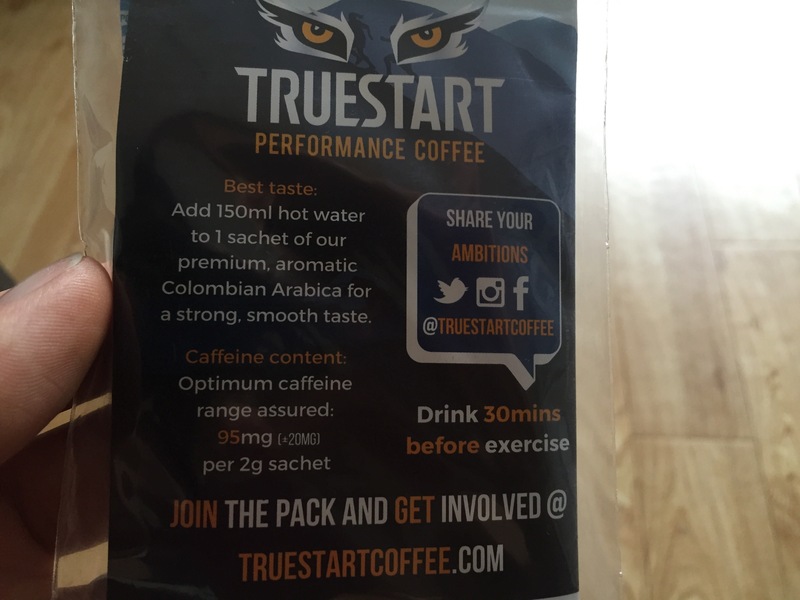 You can buy Truestart performance coffee from their website, a number of Tesco’s NutriCentre outlets and independent stores.